Universal City, California –Pioneering American music icon James Brown goes from rags to rhythm-and-blues royalty in Get On Up, a spectacular portrait of the life of the charismatic performer, debuting on Digital HD on December 9, 2014 and on DVD and Blu-ray™ Combo Pack including Blu-ray™, DVD, and Digital HD with Ultraviolet™ on January 6, 2015 from Universal Pictures Home Entertainment. Director Tate Taylor follows up his Oscar-nominated breakout film, The Help, with an explosively soul-packed story filled with stunning remixes of Brown’s original recordings, dramatic recreations of the singer’s memorable stage moments and a mesmerizing star performance by Chadwick Boseman (42) as “The Godfather of Soul.” The Blu-ray™ Combo Pack also features over an hour of bonus material, including never-before-seen interviews with the filmmakers and cast, extended and deleted scenes and additional unforgettable musical performances. 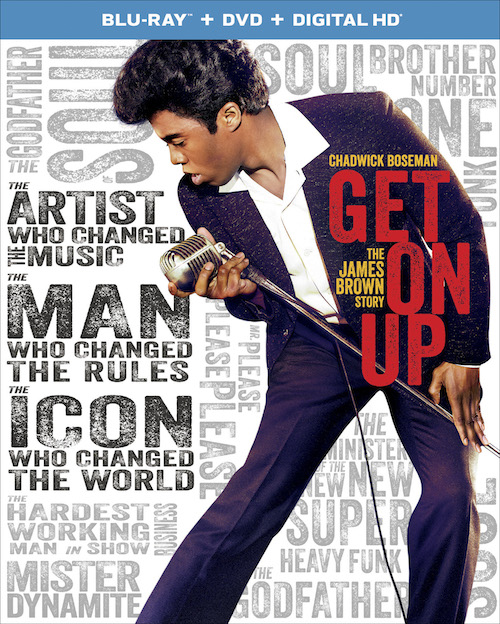 Get On Up starsChadwick Boseman (42, Draft Day) in yet another career-making performance as Brown, with a stellar supporting cast that includes Oscar®-nominee Viola Davis (The Help, “How to Get Away with Murder”), Oscar-winner Octavia Spencer (The Help, Fruitvale Station), Nelsan Ellis (The Butler, “True Blood”), Oscar-nominee Dan Aykroyd (Driving Miss Daisy, Ghostbusters), Craig Robinson (This is the End, Hot Tub Time Machine) and Jill Scott (Why Did I Get Married, Baggage Claim). For artwork, please log onto our website at www.ushepublicity.com.